↑ 1.0 1.1 1.2 1.3 1.4 "2010–11 Standings by Division". National Hockey League. ↑ "2010–11 Standings by Division". National Hockey League. 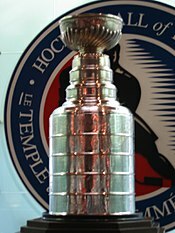 ↑ National Hockey League (May 28, 2010). "Pens host Caps in 2011 Bridgestone NHL Winter Classic". Press release. http://www.nhl.com/ice/news.htm?id=530410. ↑ "Hurricanes and Coyotes to play Russian clubs". NHL.com. ↑ "NHL Hockey Schedule for October 2010 - NHL.com - Schedule". National Hockey League. Retrieved July 30, 2010. ↑ "Player Stats: 2010–2011 Regular season: All Skaters – Total Points". National Hockey League. ↑ "Player Stats: 2010–2011 Regular season: Goalie – Goals Against Average". National Hockey League.